The Olympus Hi*Lite is a relatively small and light-weight camera. When I was searching for a camera for this project I had several criteria. Light weight - I wanted it to weight less than 8 oz fully loaded. 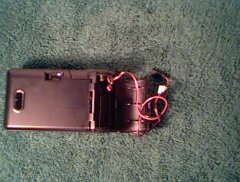 Low Cost - I wasn�t sure I was going to be able to successfully modify the camera. I didn�t want to destroy an expensive camera. After discussing what I was looking for with a very confused and unhelpful sales-droid who wasn�t sure why I cared so much about the electronic shutter I settled on the Hi*Lite. It fit my criteria and only cost $50. After reading about the camera several others had used in their camera projects I was prepared to pay more. The only thing I got that I didn�t want was auto focus. I wasn�t sure if the auto focus mechanism would have problems in flight or interfere with the picture but I was willing to give it a try. 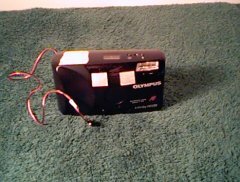 The first step in the whole project besides some rudimentary design work that existed mostly in my head was to see if I could modify the camera for external shutter activiation. This would require opening the camera and soldering wires accross the shutter contacts. I was sure this was going to be difficult and there was the distinct possiblity that I would break something rendering the camera useless. I proceed cautiously and jotted down some notes on where things like screws went as I took it apart so I would be able to get it back together later. After I had gotten the housing off I identified the shutter contacts on the top side of the camera. They were exposed traces on a circuit board interlaced very close together. This would pose a minor problem as they were too close together to solder to easily. Further investigation also revealed there were three of them, one common trace, one focus lock trace and one shutter trace. The focus lock was designed to be activated when the shutter was pressed halfway. I found that if I connected the focus lock and shutter traces together I could trip the shutter by shorting them to the common trace. This problem solved I moved on to soldering leads to these contacts. I ended up scraping the coating off the circuit board in another location to get at the common trace. I also scraped away some of the interleaved traces at the shutter contact point to give me room to solder one wire to the focus lock and shutter traces without accidentally soldering to the common as well. This all managed to work. After a little testing I put the camera back together. This would have been easier if I had five hands but somehow I managed. The one thing I didn't try was actually taking some pictures. I guess I was feeling a little cheap and didn't wan't to waste film. This would come back to haunt me. On the day of the first flight, at the field, I discovered the camera would not accept film. When the film door is closed the film is supposed to automatically advance. This was a real bummer because it delayed the maiden flight. Back home I discovered that a little film sensing lever had jammed when I reassembled the camera. Without this level the camera never thinks it has film in it. Moral: test everything before getting to the flying field. Incidentally while I had the camera open I also found the flash capacitor. Actually it found me and after I had stopped drooling and got over the shock of getting shocked I decided to put some electrical tape over its leads to protect me from further surprises. If you attept a camera modification such as this I recommend you do the same. I�m not sure if this kind of shock can be lethal but why take chance?